Well, another Fall Family Cooking Day has come and gone… and it was a great one! 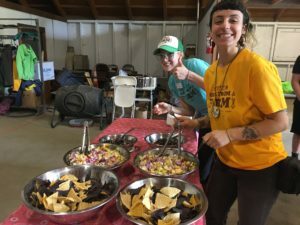 Parents and kids alike loved the farm fresh, Latin-inspired fare we cooked up. 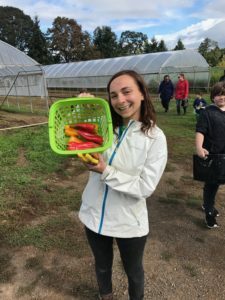 We started out with a trek to the garden and the farm (and didn’t let the rain scare us away! ), and picked some yummy kale, tomatoes, edible flowers, and peppers. We returned, some of us covered in mud, and got to work! Together we made Spanish rice, vegetarian ceviche, salsa with our shiny new bike blender, Cuban-style black beans, a zesty kale salad with a lime cilantro vinaigrette, and we even picked a farm fresh melon for dessert! It sounds like a lot of cooking, but it goes by pretty fast when you’ve got a barn full of families. 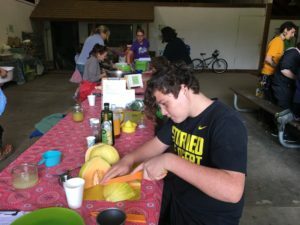 Many of the families who came to Cooking Day had never been to Sauvie Island Center before, and we think it’s safe to say we’ll be seeing them again before long. If you came – thanks for coming! 🙂 And if you missed it, keep an eye out for our Spring Family Cooking Day. We’d also love to see you all at our Family Farm Day coming up on Friday, October 12th (a day off from school)! Check out our Facebook album for more photos of fun on the farm! Fall on the Farm Fall Family Farm Day!